Down to their last chance, the Tampa Bay Rays left no doubt they were World Series-worthy, after all. The young Rays completed a stunning run to their first pennant, holding off the defending champion Boston Red Sox 3-1 Sunday night behind Matt Garza's masterful pitching in Game 7 of the AL championship series. The Rays nearly let it slip away when they blew a seven-run lead late in Game 5 and lost meekly Saturday night. 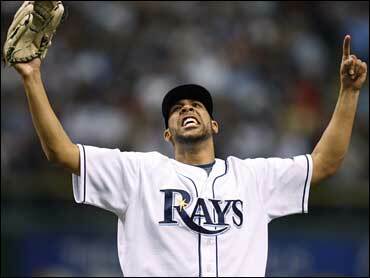 But when rookie David Price struck out J.D. Drew with the bases loaded to end the eighth inning, Tampa Bay showed it had plenty of resolve, too. Baseball's doormat since starting play in 1998, the Rays were a 200-1 shot to win the World Series before the season started. Now, they'll host the Philadelphia Phillies in Game 1 Wednesday night. Willy Aybar homered and Evan Longoria and Rocco Baldelli also drove in runs to support Garza, who limited the defending champions to Dustin Pedroia's first-inning homer and Jason Bay's one-out single in the seventh to end Boston's bid for a third pennant in five years. Four more wins and manager Joe Maddon's bunch will become the first team to go from worst in the majors to World Series champion in just one season. Longoria's fourth-inning double off Jon Lester erased a 1-0 lead the Red Sox took on Dustin Pedroia first-inning homer. Baldelli's single on an 0-2 pitch put the Rays ahead in the fifth after Aybar doubled and Dioner Navarro reached on an infield single. Garza took the mound for the biggest game of his life with something, perhaps cotton balls, stuffed in his ears to help drown out the noise at sold-out Tropicana Field. He walked David Ortiz after giving up the homer, then quickly settled into a groove. The 24-year-old right-hander struck out nine before shortstop Jason Bartlett booted Alex Cora's ground ball for an error, leading off a tense eighth. Boston went on to load the bases when Kevin Youkilis drew a two-out walk. Price, the No. 1 pick in the 2007 draft, became the fifth Tampa Bay pitcher of the inning  quite a spot for someone who started the year in Class A. Drew, who capped the Game 5 rally with a ninth-inning single, struck out with a check-swing on a 97 mph fastball to end the threat. Price worked around a leadoff walk in the ninth and when pinch-hitter Jed Lowrie grounded out, the celebration began. The Rays dropped the "Devil" from their name before the season and came out with a new identity: Gone were the laughable losers who finished last in the AL East in nine of their first 10 seasons, the snowbird specials whose quirky Tropicana Field filled with transplanted Bostonians whenever the Red Sox visited. After splitting the first two games of the series at home, though, it was Tampa Bay that made itself at home in an opponent's ballpark, with B.J. Upton and the Rays sending shot after shot sailing over the Green Monster. In all, the Rays outscored the Red Sox 29-13 in the three games at Fenway Park, hitting 10 home runs. But the young Rays' postseason inexperience showed in Game 5, when a normally trusty bullpen blew a 7-0 lead over the last three innings, allowing Boston to save its season with an 8-7 victory. The Red Sox were the eighth team to rally from a 3-1 deficit to force Game 7 of an LCS, and they're the only club to do it more than once. The Red Sox also battled back in 1986, 2004 and 2007, and went on to win the World Series the last two times. With the tarps covering nearly 5,800 seats in the upper deck removed for the second straight night, more than 40,000 fans packed the domed stadium for a rematch of the starting pitchers from Game 3, won by Tampa Bay 9-1 at Fenway Park. Many fans wore Red Sox gear and were even more noticeable when they stood and cheered as Pedroia circled the bases after lining a pitch into the left-field stands. But there would be little for the Boston faithful to cheer the rest of the night. No team has repeated as World Series champion since the New York Yankees won three straight from 1998-2000. That mark is safe for another year. Notes: Rays senior adviser Don Zimmer, a former Red Sox manager who has six World Series rings, threw out the ceremonial first pitch.